The Adventures of Beanboy by Lisa Harkrader. Review: Superheroes and sidekicks, we all have a favorite. But what about the sidekick Beanboy? The Adventures of Beanboy by Lisa Harkrader is a superior book. It will hook you till the end. The story begins in a comic shop when the main character, Tucker MacBean is read his favorite comic book. The school bully, Sam, sees him starring at her and rips his comic book for no reason and throws it in a puddle. A dejected Tucker sulks home, but his mood changes when he sees an entry form for the perfect contest. All he would have to do is create a great sidekick for a comic and then he'd win a full college scholarship. His mother who has gone back to college herself needs the money, so Tucker decides to write a comic and put his mother's name on it. But he realizes the prize is non transferable so he doesn't know what to do. To complicate manners, his little brother, Beecher, could mess up his comic so he works in silence away from everyone. Will Tucker win the contest for his mom? Will his brother mess up his project? Will he put his mother's name on the comic so it looks like she won? Find out by reading The Adventures of Beanboy. The Adventures of Beanboy is a first-class book. I can't reveal if Beanboy wins the contest or not so you'll need to read the book. Beanboy deserves 100 out of 5 stars. Beanboy is easily to relate to because his of his overall goal to try and to get money for something important in the family. At times, Beanboy is funny, sad, heartwarming, and frustrating- all at the same time. The book will greatly interest middleschoolers 6th through 8th grade and this is a great book for comic book lovers and people who are looking for a new book to read. Everyone should read and buy this book. The Adventures of Beanboy is perfect for long trips, lazy days, a boom review, and days at the beach. Also, it's perfect just for plain fun. We would like to thank Houghton Mifflin Harcourt for providing a copy of The Adventures of Beanboy for this review. 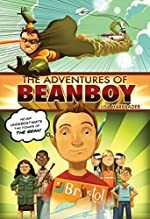 Have you read The Adventures of Beanboy? How would you rate it?